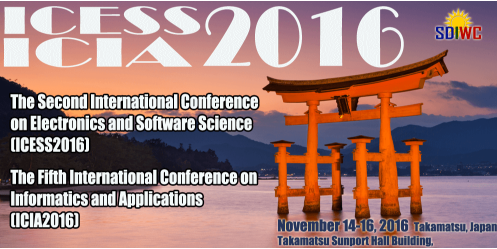 The deadline of submission of full papers for ICIA2016 and ICESS2016 has been extended to October 18, 2016. Researchers are encouraged to submit their work electronically. Submitted paper should not exceed 15 pages, including illustrations and it must be without page numbers. The submission must be for the full paper (abstracts only are not acceptable). All submitted papers will be fully refereed by a minimum of two specialized referees. Before final acceptance, all referees comments must be considered. All registered papers will be published in the conference proceedings. Should you have any question, please feel free to contact us by email to icess16sdiwc.net or icia16sdiwc.net.